Liechtenstein is a small and highly industrialized country in Europe. Its gross domestic product (GDP) per capita ranks among the world’s highest. The capital is Vaduz. German is the official language of Liechtenstein, but a dialect of German called Alamannic is commonly spoken. Approximately 74% of the population is Roman Catholic and about 8% is Protestant. Liechtenstein is a constitutional monarchy governed by a hereditary prince, who serves as head of state. Legislative power is exercised by the unicameral parliament called the Landtag, made up of 25 members elected by universal adult suffrage. On the recommendation of parliament, the prince appoints a chief of government and four councilors who form the government. Since 1919, Switzerland has represented Liechtenstein diplomatically. 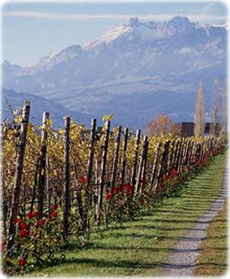 Vineyard in Vaduz, capital of Liechtenstein. Vaduz is a town situated along the banks of the Rhine in the west central part of the country. It is home to the State Art Museum, which displays some of the art collected by Liechtenstein’s princes over the centuries. Also located in Vaduz is the Postage Stamp Museum, which showcases the hundreds of colorful stamps issued by the principality. The castle of the prince of Liechtenstein stands on a bluff high above the town. The nearby community of Schaan is Liechtenstein’s largest town. The modern history of Liechtenstein dates from 1719, when the Liechtenstein family of Austria consolidated its control of the feudal territories of Vaduz and Schellenberg. The family united the territories as the principality of Liechtenstein under the Holy Roman Empire. Following the collapse of the Holy Roman Empire, in 1806, Liechtenstein was briefly occupied by the armies of French emperor Napoleon I. In 1815 Liechtenstein became a member of the German Confederation. When the confederation dissolved in 1866, following the Seven Weeks’ War, Liechtenstein became independent. After the war, the Habsburg monarchy, with which Liechtenstein remained closely allied, continued to represent Liechtenstein’s interests abroad. In 1868 Liechtenstein declared its permanent neutrality and disbanded its army. When the Habsburg monarchy was abolished after WWI (1914-1918), Liechtenstein developed close connections with neutral Switzerland. In 1919, Liechtenstein gave Switzerland authority over its diplomatic relations. It adopted the Swiss currency in 1921 and in 1924 joined with Switzerland in a customs union. Prince Franz Joseph II, who became Liechtenstein’s monarch, in 1938, yielded executive authority in 1984 to his son and heir, Crown Prince Hans Adam II. Hans Adam succeeded his father in 1989. Liechtenstein joined the United Nations in 1990.